Ireland’s Katie Taylor (7-0, 4KO) fulfilled her dream of becoming a world champion with a Unanimous Decision victory over Anahi Esther Sanchez (17-3, 9KO). It was a hard-fought win for Taylor courtesy of three 99-90 scorecards, which didn’t reflect the effort of Sanchez who forced Taylor to call on all of her energy reserves. 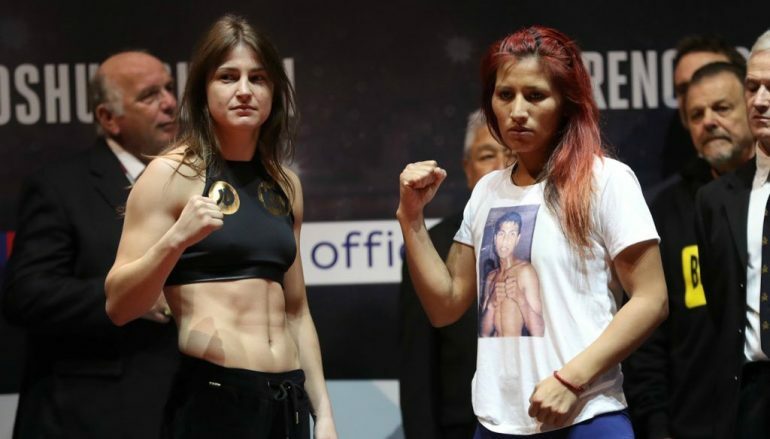 Sanchez was unable to retain her WBA lightweight title, which she won in September, as she was over the nine stone nine pound lightweight limit on the weigh-in scales at the Motorpoint Arena on Friday. Taylor is one of the best-known sport stars in Ireland following a trailblazing amateur career that saw her win Olympic Games, European and World Championships gold medals. Whilst fighting for a world title in just Taylor’s seventh contest sounds early, it’s a reflection of the lack of depth in female professional boxing – especially compared to the amateur scene. In truth, Taylor could have fought for the highest of honours at the start of her paid journey and has found herself relatively unchallenged by the standard of opposition prior to tonight’s fight. One of the main differences between male and female boxing is the length of round, which changes from three to two minute rounds. The more concise sessions often see women get going quicker and Taylor was a prime example of that. She laid in to Sanchez with stinging two-fisted flurries in the opener and soon made a breakthrough in the second round, switching focus to Sanchez’s body. A left hook sank the former champion to her knees and Snachez only just returned up right in time, right on the brink of referee Steve Gray’s intended 10 count. To Sanchez’s credit, she dug in and displayed her gritty in the following round, keeping Taylor alert with heavy shots of her own and she seemed more comfortable at the close of the third. 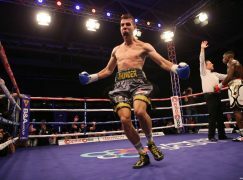 The pattern continued in to the fourth round as Sanchez turned tables and attempted to hunt an evasive Taylor. An accidental head clash disrupted proceedings in the sixth round and it was the only break to a red hot pace set by both boxers. Slight swelling emerged on Taylor’s face soon after, though her poker face remained neutral. The bout was evenly balanced as it headed in to the final three rounds and both battled hard to edge themselves ahead. It resulted in both smothering their own work and a light increase in rabbit punches. Taylor aimed to time Sanchez with wide right hooks in the ninth, retreating to the edges of the ring to tempt Sanchez forward. The visitor obliged and pressed the action but neither could dominate the action. The final round repeated the pattern, though Taylor made an extra effort to close with quick three and four punch combinations to catch the eye of the judges. However, neither party appeared confident of victory when the final bell sounded.